MEASURE YOUR NEEDS . . . SIMPLICITY YEOMAN 616 (No. 415) Above has 6 hp Briggs and Stratton engine with "Easy-Spin" starting (110 volt electric starter optional). Shown with 32" rotary mower, mounted on the front axle (Simplicity's famous anti-scalp patented mounting) to tilt with front wheels. Mows 1.2 acres per hour, with adjustable height from 1-5/8" to 3-1/2". HERE'S a compact tractor with a 20" turning radius that works as well as it looks, and it will take less space in your garage than a riding mower. Newly designed by Simplicity engineers with simplicity in mind for you, the 6 hp Yeoman offers convenience with class.., an outdoor helper that's long on comfort, with extra power for the heavier jobs. The Yeoman not only has the engine up front to give it that "big tractor" look and performance, its powerful enough to handle many of the tractor jobs. It steps right out with a 32" rotary mower, a 40" grader blade, a 32" rotary snow thrower, a 42" snow plow and dozer blade, and many other back-saving, leisure-gaining attachments. 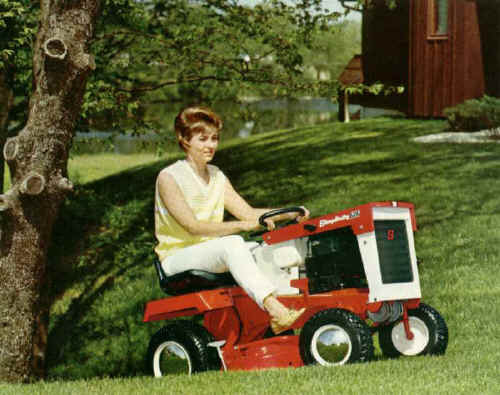 The Yeoman hustles through good-sized mowing jobs in a matter of minutes, cutting up to 1.2 acres per hour. The rear tires are 61/2'' wide, providing sure-footed traction without leaving tread marks, and treating the rider as gentle as the lawn. 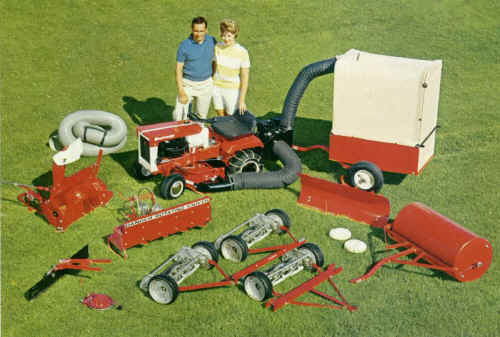 When you're done with the lawn, the Yeoman is ready to handle a host of other jobs with your choice of its quick-switch attachments. The Yeoman climbs up and down 40% slopes. It has two speeds forward and one reverse, moving at 2.5 mph in low, and 3.9 mph in high. With the optional low speed kit, you can reduce the above speeds by one-third, resulting in four speeds forward and two reverse. It's sure-footed, too, thanks to its Controlled Traction. When one wheel is on a slippery surface, the other wheel continues to drive and provide traction. You with can make a Yeoman as fancy as you want, with a choice of accessories -- such as chrome hub caps -- that add to its attractive design and give pride in ownership. The Yeoman's foot operated clutch-brake combination gives positive control of the unit. Nothing was overlooked by Simplicity engineers to bring you one of the finest performers ever to tackle outdoor jobs. With its dependable 6 hp engine, you'll find it's always willing to work. No wonder it's called the Yeoman. Specifications of Engine: Briggs & Stratton 6 hp, 4 cycle, single cylinder, vertical shaft, air cooled engine equipped with large recoil starter; Oil bath air cleaner, gear impeller lubrication system, with oil capacity of 2 ¼ pts. ; Mechanical governor and throttle control Piston displacement: 14.11 cu. in. Bore and stroke, 2-3/4 x 2-3/8. Specifications of Unit: Deluxe deep foam seat mounted on rubber (Controls conveniently located for safety); "Soft action" brake-clutch combination. All gear transmission with controlled traction providing torque to both wheels retaining differential action when on wheel slips; Two speeds forward and one reverse, with speeds ranging from 2.5 mph to 3.9 mph; Turning radius, 20 in; Pneumatic tires, 4.10/3.50 x 6 in front, and 16-6.50 x 8 in rear; Frame is electrically welded heavy gauge steel.